One of the pleasures of collecting old photographs is the (perhaps unsurprising) genealogical content they embody – or maybe that’s just me. The focus of my recent collecting has been Hollywood photographs of the 1910s, ‘20s, ‘30s, ‘40s, and even ‘50s; I find my interest drops off at about 1960. To some extent, my collection process is driven by the genealogist in me, as I like to buy images of Hollywood wives (and their husbands) or husbands (and their wives). For someone like Joan Crawford, who married three of her co-stars, such a policy leads quickly to further purchases. 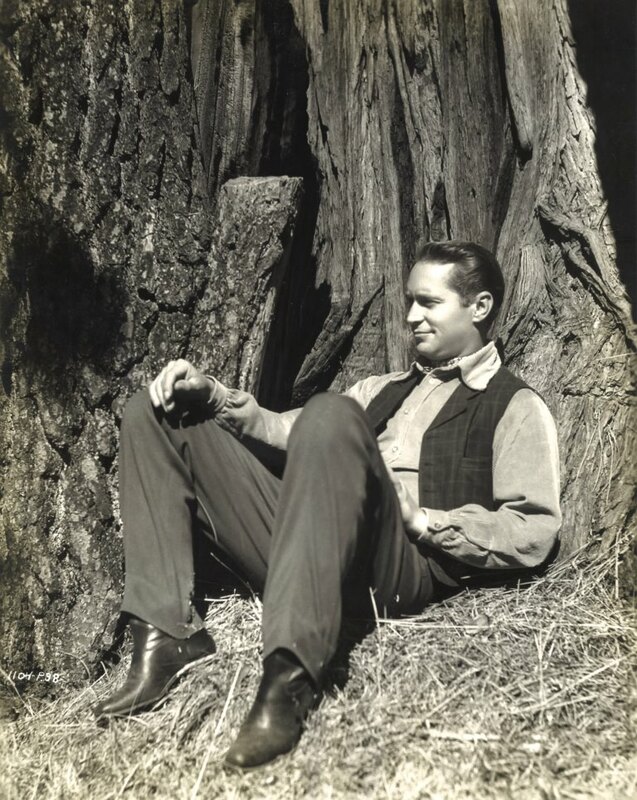 Franchot Tone (1905–1968) was Joan Crawford’s second husband (after Douglas Fairbanks Jr. and before Philip Terry), but I include this image for another reason: it is one of several photographs in my collection created by members of the same family. One of the earliest images I own shows House Peters (Sr.) (1880–1967) photographed by Jack Freulich (1880–1936), the first “name” photographer to run a stills department at a major studio. 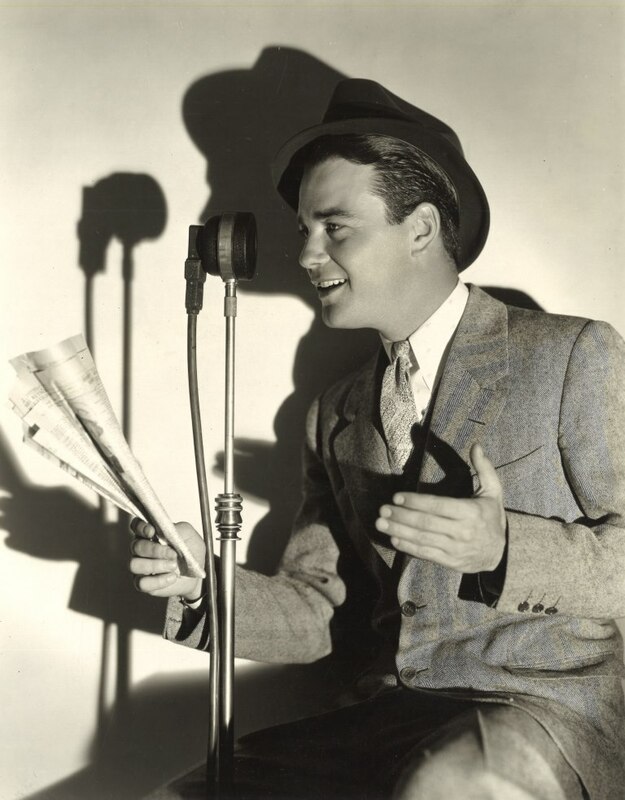 A later image by Jack (who was generally credited as “Photograph by Freulich”) shows Lew Ayres (1908–1996): taken about ten years later, it shows the development of the 1930s style of lighting, which led to crisply defined shadows and outlined faces and bodies in a way quite different from the treatment given Peters. 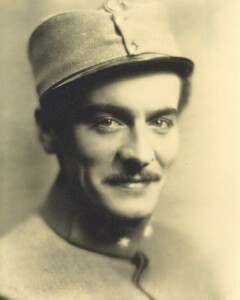 The career of Jack Freulich’s brother Roman (1898–1974), lasted into the 1960s. In addition to his photo of Franchot Tone, I have a striking image (at right) of the Broadway star June Knight (1913–1987). To me it shows Jack Freulich’s influence, with its focus on Miss Knight’s sculptured cheekbones and mascaraed eyelashes. Finally, I have images by Jack Freulich’s son Henry (1906–1985). 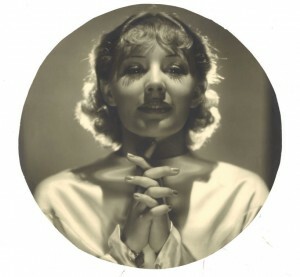 Taken in the mid-1920s, they owe more to the House Peters photo than to any of the others, but in fact they have a softness that is a bit alien to Jack or Roman’s oeuvre (at least in these examples). 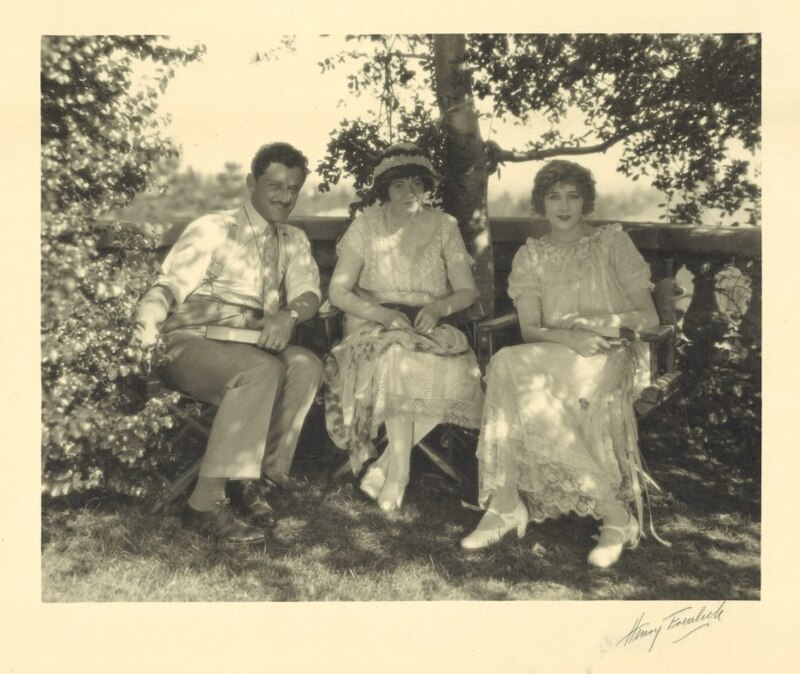 The group photo shows the Italian cinematographer Silvano Balboni with his wife, scenarist June Mathis (1889–1927), and a friend. * The other one (below), whose subject reminds me of Adolphe Menjou, is unidentified. The subject of the photograph, and the identity of the photographer, matters to me, and it is nice when it’s possible to collect images created by (or about) members of the same family. Franchot Tone was married to Joan Crawford 1935–39, Jean Wallace 1941–48, Barbara Payton 1951–52, and Dolores Dorn 1956–59. Joan Crawford and Douglas Fairbanks Jr. were married 1929–33. Joan Crawford and Philip Terry were married 1942–46. 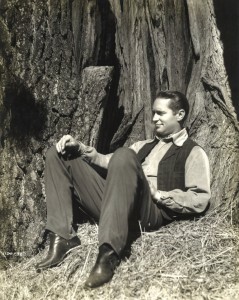 House Peters was the father of the actor House Peters Jr. (1916–2008). Lew Ayres was married to Lola Lane 1931–33 and to Ginger Rogers 1934–40. *Now identified as Anna Q. Nilsson (1888–1974). This is a curious topic for a family history website. Scott, I grew up in Los Angeles (later than the subjects in your photos today) so I love your postings on old Hollywood. Franchot Tone, Joan Crawford, Douglas Fairbanks Jr., Lew Ayers, Ginger Rogers, Adolphe Menjou … sigh … what great memories! I love the lighting in the photos of House Peters Sr. and June Knight. I’ve tried to identify your two unidentified faces. The lovely lady looks so familiar, but of course her fashionable hair and makeup is so typical of her day that I cannot distinguish her from her contemporaries. But you’ve piqued my interest! And you’ve made me think about my own professional family photographic portraits, none of which have the dramatic lighting or posings of your fabulous collection! Dear Scott, I can inform you that the beautiful friend in the group photo is the Swedish silent movie star Anna Q Nilsson. Silvano was the director of her film The Masked Woman in 1927, also staring Swedish actor Einar Hanson. Great picture! I think your Hollywood pics are great. 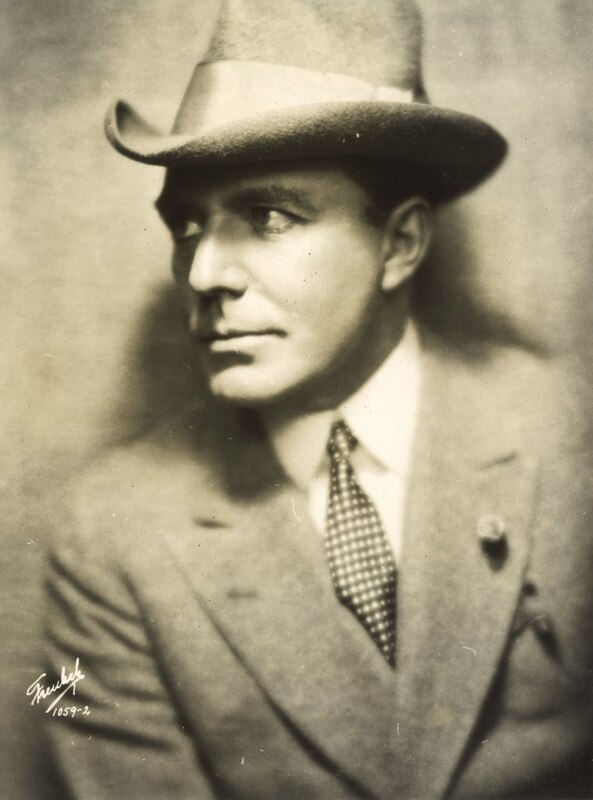 A shirttail relative of mine (as my mother would put it) went from New Mexico to Hollywood in the 1920s hoping to become a star. She got as far as being a “leg double” in silent movies. This woman rode as a child back home on the ranch, so she was also the stunt double for stars in westerns who didn’t want to risk doing their own stunts. Another relative, her granddaughter, has some snapshots with the leg doubles showing off their legs between shots on the set. Don’t know who the photographers were, though. Thanks, Doris! It’s fascinating to see the kinds of photos the studios had taken in this period — a lot of grist for a lot of mills. This is amazing information. We have just discovered that Jack Freulich is my husbands Great Uncle. Henry was my husbands grandfathers contact in Los Angeles when he immigrated from Poland with his family. Pieces coming together. We are now looking for a few photos that “Great Uncle Jack” took for very our own. Thank you for this. Diane, That’s wonderful news! I have a number of Jack, Roman, and (I think other) Henry Freulich images — I will look them up on Monday!